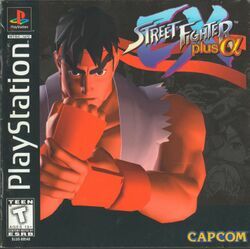 Street Fighter EX Plus α is a PlayStation game developed by Arika and published by Capcom in 1997. It is the only home conversion made of the original Street Fighter EX game, and is based on the Plus version. It also adds two new characters, Dhalsim and Sakura, as well as a number of new modes of play. The most innovative new mode of play is probably the Expert Mode. In this mode, you are challenged to complete 15 missions for all of the initially selectable characters. The missions are ranked from E for easy to A for the hardest. The E missions are to simply execute the various special moves and super moves of a character. The D missions feature simple combos. The C missions to the final mission for each character are about executing increasingly difficult combos. You earn points for every successful mission, and these points are used to unlock various hidden characters and features within the game. Another added mode is the Barrel Bonus Game. This game is an homage to one of the bonus rounds provided by the original Street Fighter II game where players had to break barrels that rolled off a conveyor belt. While the concept is the same, the complexity is much greater. Barrels come from many different sources, and have different degrees of damage they can endure before they will break. You obtain this mode by fully completing Expert Mode, which is a very difficult task. Alternatively, there is a code you can enter to access it instead.